I've been waiting, but bottarga (cured mullet roe) has yet become a mainstream in LA food scene. You occasionally find in dishes at some Italian restaurants, but it's still hard to find at local stores. So, I think I will have to wait until Eataly LA opens next year... When I eat bottarga, I want to really taste it. The other night, I had cannellini beans with bottarga at Pecorino Restaurant in Brentwood. It was a good dish and I understand that they can't give you generous shaving of bottarga for what they charge. It made me crave for bottarga so much. I wanted to chew on it and savor it. 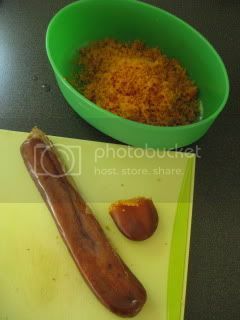 And, luckily, here's my special bottarga I got from my friend. I used the entire log (half package) of it for our pasta lunch for 2. 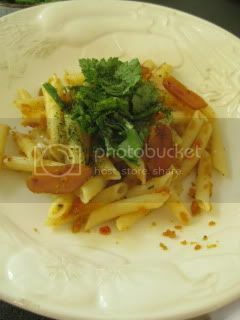 Once penne was cooked, I tossed the pasta with olive oil and grated bottarga. To finish, the pasta was topped with more sliced bottarga, ao-nori (Japanese seaweed powder), and Japanese herb mixture (asatsuki, mitsuba, and shiso). I was in heaven! Side dish was simple donabe steam-fried peashoot, which was made with my tagine-style donabe, "Fukkura-san". 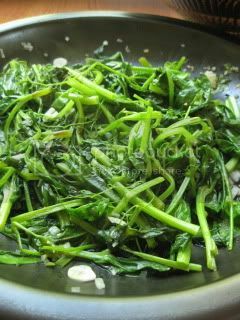 Peashoot was steam-fried with shallot and garlic, then seasoned with salt, pepper, and a little drizzle of my homemade donabe-smoked soy sauce.